Black Canyon of the Gunnison National Park is a U.S. National Park located in western Colorado, and managed by the National Park Service. The Park itself encompasses an area of 47 square miles (122 square km) and contains the deepest and most dramatic 14 miles of the canyon, which continues upstream into the Curecanti National Recreation Area and downstream into the Gunnison Gorge National Conservation Area, for a total of 53 miles. Sheer black walls of schist and gneiss plummet as much as 2,700 feet along the narrow gorge known as the Black Canyon. It is like a raw cut in the Earth's crust exposing millions of years of geologic history, while sunlight enters only briefly each day due to its narrow opening. The Gunnison River runs along the canyon floor. 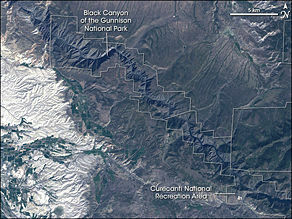 Satellite image of the park and Curecanti National Recreation Area. On the western edge of the Rocky Mountains in the state of Colorado lies a steep, dark, and rugged canyon formed by the Gunnison River as it flows through hard ancient rocks. The canyon walls are predominantly black in color. The depth of the gorge reaches over 2,000 feet and with the narrow opening - in many places only 1,500 feet across - the light of the sun only briefly and narrowly reaches inside. Established as a national monument on March 2, 1933, the Black Canyon was upgraded to the status of a National Park on October, 21, 1999. 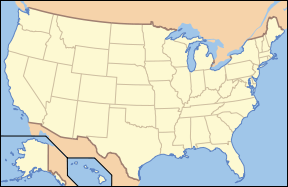 It became the 55th U.S. National Park, and the third smallest. At that time the National Park Service added 10,000 acres of wilderness to help protect the striking beauty and wildlife habitat of this river corridor. The Park itself encompasses an area of 47 square miles (122 square km). At the section where its walls are steepest, it is 10 miles (16 km) long with depths ranging from 1,730 to 2,425 feet (525 to 740 meters), while its rim width narrows to 1,300 feet (400 meters) and its floor width to 40 feet (12 meters). The length of the Black Canyon that lies within the Park is 14 miles, however the canyon extends into the Curecanti National Recreation Area and the Gunnison Gorge National Conservation Area, and totals 53 miles. The Black Canyon is shocking in its suddenness - there are no mountains, spires or wide open canyons to alert one to its approach. As visitors to the park will testify, stopping at a park overlook and looking into a 2,000 foot canyon which was not visible just a few steps before is stunning. As Wallace Hansen of the U.S. Geological Survey wrote, "No other North American canyon combines the depth, narrowness, sheerness and somber countenance of the Black Canyon." The Black Canyon hosts a variety of ecosystems from pinyon pine, juniper and scrub oak forests at the rim, to the shady and vertical inner canyon walls, and down to the riparian community along the Gunnison River at the bottom of the gorge. The Park area contains a wide variety of flora and fauna. Some common plants that are native to the park include Aspen, Ponderosa pine, Sagebrush, Desert Mahogany, Utah Juniper, Gambel oak (scrub oak) and Singleleaf Ash. Poison Ivy is abundant at the canyon's bottom. Animal life in the park includes bobcats, coyotes, elk, fox, mule deer, the yellow-bellied marmot, and rock squirrels. Birdlife includes the Golden Eagle and the Bald Eagle, as well as the Great Horned Owl, the American dipper, the Magpie, and Steller's Jay and migratory birds such as the Mountain Bluebird, the Peregrine Falcon, the White-throated Swift and the Canyon Wren. The Ute Indians had known of the canyon long time before the first Europeans saw it. By the time the United States gained independence in 1776, two Spanish expeditions had passed by the canyons. In the 1800s, the numerous fur trappers searching for beaver pelts would have known of the canyon's existence but they left no written record. By the late 1800s and into the early 1900s, the canyon had been thoroughly explored and while the first explorers came for commercial success and wealth, the later visitors came to see the canyon as an opportunity for recreation and personal enjoyment. Federally funded expeditions included the: Gunnison Expedition of 1853; Bryant Expedition of 1883; Pelton Expedition of 1900; Torrence & Fellows Expedition of 1901; and Kolb Expedition of 1916. Painted Wall on the north side of the canyon. It is the highest sheer cliff in Colorado at 2250 feet (685 m). Lighter-colored pegmatite dikes are clearly visible. The Gunnison River drops an average of 43 feet per mile (8 m/km) through the entire canyon, making it one of the steepest mountain descents in North America. In comparison, the Colorado River through the Grand Canyon drops an average of 7.5 feet per mile (1.4 m/km). The greatest descent of the Gunnison River occurs in the park at Chasm View dropping 240 feet per mile (45 m/km). The Precambrian gneiss and schist that makes up the majority of the steep walls of the black canyon formed 1.7 billion years ago during a metamorphic period brought on by the collision of ancient volcanic island arcs with the southern end of what we now know as Wyoming. The lighter-colored pegmatite dikes that can be seen crosscutting the basement rocks formed during this period as well. The narrowest part of the Black Canyon, looking down from Chasm View at twilight. The entire area underwent uplift during the Laramide orogeny between 70 and 40 million years ago which was also part of the Gunnison Uplift. This raised the Precambrian gneisses and schists that make up the canyon walls. During the Tertiary from 26 to 35 million years ago large episodes of volcanism occurred in the area immediately surrounding the present day Black Canyon. The West Elk Mountains, La Sal Mountains, Henry Mountains, and Abajo Mountains all contributed to burying the area in several thousand feet of volcanic ash and debris. The modern Gunnison River set its course 15 million years ago as the run-off from the nearby La Sal and West Elk Mountains and the Sawatch Range began carving through the relatively soft volcanic deposits. With the Gunnison River’s course set, a broad uplift in the area from 2 to 3 million years ago caused the river to cut down through the softer volcanic deposits. Eventually the river reached the Precambrian rocks of the Gunnison Uplift. Since the river was unable to change its course, it began scouring through the extremely hard metamorphic rocks of the Gunnison Uplift. The river’s flow was much larger than currently, with much higher levels of turbidity. As a result the river dug down through the Precambrian gneiss and schist at the rate of 1-inch (25 mm) every 100 years. The extreme hardness of the metamorphic rock along with the relative quickness with which the river carved through them created the steep walls that can be seen today. A number of feeder canyons running into the Black Canyon slope in the wrong direction for water to flow into the canyon. It is believed that less-entrenched streams in the region have shifted to a more north-flowing drainage pattern in response to a change in the tilt of the surrounding terrain. 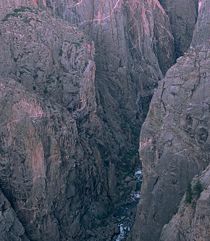 The west-flowing Gunnison, however, was essentially trapped in the hard Precambrian rock of the Black Canyon and could not change its course. The main attraction of the park is the scenic drive along the south rim of the canyon. There is a campground and several miles of hiking and nature trails. The north rim is accessible by automobile, though it is quite remote, and has a small, primitive campground. The river can be accessed by a steep, unmaintained trail that takes about four hours to hike down and six to hike back up. The Black Canyon is a center for rock climbing, in a style known as traditional climbing. Most of the climbs are difficult and are only done by advanced climbers. Rafting opportunities exist in the region, but the run through the park itself is a difficult technical run for only the best kayakers. There are several impassible stretches of water requiring long, sometimes dangerous portages to get around. The remaining rapids are class III - V, and are for expert river runners only. Downstream, in the Gunnison Gorge National Conservation Area, the river is somewhat easier, though still very remote and for experienced runners only, with rapids that are Class III - IV. ↑ Gorp.com. Black Canyon of the Gunnison National Park Retrieved July 20, 2008. ↑ Encyclopædia Britannica Online. 2008. Black Canyon of the Gunnison National Park Retrieved July 20, 2008. ↑ National Park Service. Plants Retrieved July 20, 2008. ↑ National Park Service. Animals Retrieved July 20, 2008. ↑ National Park Service. History & Culture Retrieved July 20, 2008. ↑ 6.0 6.1 National Park Service. Black Canyon Dimensions Retrieved July 20, 2008. ↑ National Park Service. The Geologic Story Retrieved July 20, 2008. ↑ 9.0 9.1 9.2 Trista Thornberry-Ehrlich. 2005. Black Canyon of the Gunnison National Park & Curecanti National Recreation Area: Geologic Resource Evaluation Report National Park Service. Retrieved July 20, 2008. ↑ National Park Service. From Past to Present Retrieved July 20, 2008. ↑ National Park Service. Things to do Retrieved July 20, 2008. ↑ Bureau of Land Management - Colorado. Gunnison Gorge National Conservation Area Retrieved July 20, 2008. Away.com - GORP. Black Canyon of the Gunnison National Park Retrieved June 24, 2008. Crossley, John. Black Canyon of the Gunnison National Park The American Southwest. Retrieved June 24, 2008. National Park Service. Black Canyon of the Gunnison Retrieved June 24, 2008. Tweto, O. Colorado Geology. Rocky Mountain Association of Geologists, 1980. History of "Black Canyon of the Gunnison National Park"
This page was last modified on 11 June 2016, at 15:48.